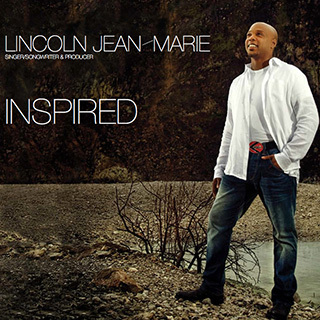 Lincoln Jean-Marie was in the midst of 2012’s biggest celebrations – the Queen’s Jubilee and the London Olympics – singing alongside musical giants such as George Michael and Stevie Wonder. Performing to global audiences and touring with the likes of Robbie Williams and Will Young has become normal for Lincoln, but the singer’s journey may only just be beginning as 2013 sees the release of his first solo album: Inspired. Having survived a cancer scare and witnessed the power of prayer first hand, Lincoln’s debut solo release speaks of his experience of God. It combines musical genres including pop, jazz and funk to create a unique and vibrant sound. Lincoln’s story begins in Hackney, East London. Lincoln’s earliest memory is a musical one – searching through his older brother and sister’s record collection, pulling out everything from Jazz to Reggae to Pop. He may have only been a schoolboy, but Lincoln already thought of himself as a musical connoisseur! Shortly afterwards, the young singer found himself achieving his dream with three new friends. Widespread attention was attracted as vocal group ‘Peace By Piece’ were awarded ‘Best Newcomers’ at the very first MOBO awards in 1996. A record deal with Warner Brothers followed. Despite top music shops such as HMV selling out of Peace By Piece’s first single, the group charted just outside the top 40 and, along with 90 other acts was dropped from Warner. Yet disappointment would soon turn into opportunity as Lincoln was asked to tour with Craig David – who turned out to be a fan of Peace by Piece. “How things turn around! While I was in Craig’s band I met my now wonderful wife…God was watching over me.” Lincoln smiles. The next highlight in Lincoln’s musical career was being hand picked by George Michael to join the megastar’s touring band. The result of all this creativity is ‘Inspired’ – Lincoln’s first EP. Honest and straight from the heart, the singer isn’t out to prove anything. Listeners can pay what they want to receive four songs dedicated to God. Musically, Inspired is a combination of the singer’s favourite styles: Soul, Jazz and Funk. Lyrically, it’s positive, energetic and uplifting. Lincoln believes there’s a lot of “dark music” in the mainstream arena. “On a spiritual level, it’s very sad. Most commercial music has a dark cynical edge to it.